MOSCOW (Sputnik) - Russian President Vladimir Putin is starting a two-day visit to Ankara on Tuesday, during which he, jointly with his Turkish counterpart Recep Tayyip Erdogan, will co-chair a High-Level Turkish-Russian Cooperation Council (HLCC) meeting and discuss bilateral cooperation and international issues. During the HLCC meeting, which will be held on Tuesday, the sides are expected to discuss in depth conditions and prospects for development of trade and economic cooperation, implementation of strategic projects, including those in the energy sector. Regional and international issues, including Syria and fight against terrorism will also be discussed. According to Russian presidential aide Yuri Ushakov, Putin and Erdogan will also discuss bilateral defense industry cooperation including the delivery of S-400 air defense missile systems to Turkey. The following video shows the arrival of the Russian president. As part of the visit, the leaders also participated in a groundbreaking ceremony for Turkey's Akkuyu Nuclear Power Plant, which is supposed to be constructed by Russian nuclear corporation Rosatom after the company obtains the required licenses. In 2010, Moscow and Ankara signed an intergovernmental agreement on cooperation on the construction and operation of the Akkuyu NPP. The NPP's four power units — which each have a capacity of 1,200 megawatts — are each expected to produce about 35 billion kilowatt-hours per year. The project's total cost is about $20 billion. 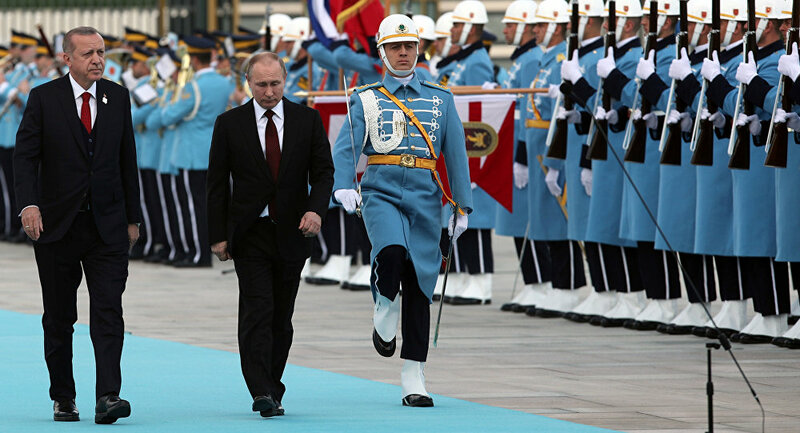 "In fact, today we are not only present at the construction of the first Turkish nuclear power plant, but we are also creating the basis for Turkey's nuclear industry as a whole," Putin said. According to Putin, the construction of the Akkuyu NPP will be carried out in line with the highest standards of safety and environmental requirements. The Russian president expressed certainty that "the joint coordinated work of Russian and Turkish specialists will make it possible to accomplish all the planned tasks on time" to ensure the launch of the first unit of the Akkuyu NPP in 2023. "We are grateful to the Turkish colleagues for the decision to grant the joint project the status of a strategic investment, to expand the list of tax privileges and preferences for it. I want to thank all Turkish friends for this decision as it made this project economically feasible and profitable," he added. This plant will cover 10 percent of our country's electric power needs. This is clean energy, it will ensure our energy security and will play an important role in the fight against climate change," Erdogan said. — yurdagül şimşek (@yurdagulsimsek) 3 апреля 2018 г. The trilateral summit on Syrian settlement of the heads of states, guarantors of the Astana process — Russia, Turkey and Iran — is scheduled for the second day of the visit.